BEATING THE THROW: As Sullivan County Big League team coach John Wilhelm (14) looks on, Jessica Wright crosses the bag at first after beating out an infield grounder in the fifth inning of Sundays game. Catching the throw a second too late is New Windsor first baseman Kayla Farinella. 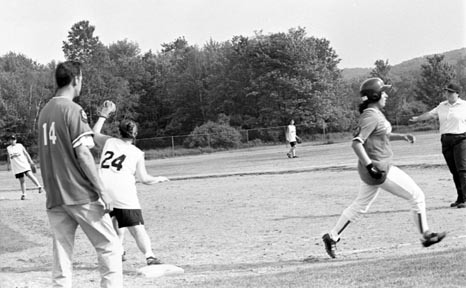 WHITE SULPHUR SPRINGS  June 13, 2000 -- The Sullivan County American Legion Big League Softball team began its season with a win on Sunday afternoon. Paced by the pitching of Karin Blaut, the Sullivan County team defeated New Windsor, 5-2 in the first game of what was supposed to be a double-header at the White Sulphur Springs Firemens Field. Mother Nature had other ideas, however. Following the contest, the teams were taking a short break when a powerful thunderstorm struck the area. The torrential downpour and high winds cancelled the second game. Blaut allowed only three hits while strking out nine and walking three on the afternoon. After New Windsor grabbed a 2-0 lead in the second inning, Sullivan County took advantage of New Windsor mistakes to give Blaut all the run support she needed. In the bottom of the frame, the SC squad loaded the bases against New Windsor pitcher Allison Hightower. A wild pitch then allowed Stacie Blaut to race home from third. Following a walk to Michele Olson, a SC runner was stationed at each base. Karin Blaut then scored on a passed ball, which knotted the score at 2-2. Marissa Rivera led off the bottom of the third with a triple and later scored on a wild pitch. The next batter, Amanda Irwin doubled to center and advanced to third on a groundout. Irwin safely slid into home after a Hightower pitch eluded the grasp of catcher Shannon Hickey, which gave the home team a 4-2 lead. One inning later, Jennifer Pellman scored the final SC run on another passed ball. Although the SC squad only had six hits on the day, defense  the team did not commit a single error in the field  and Blauts control keyed the victory. The Sullivan County team, which is sponsored by the Floyd Keener American Legion Post 315 of Roscoe, consists of 15 girls from around the county. They include: Jenn Ackermann (Delaware Valley), Kristen Ahrens (Liberty), Karin Blaut (Eldred), Stacie Blaut (Eldred), Christina Head (Delaware Valley), Amanda Irwin (Livingston Manor), Michelle Olson (Liberty), Linnea OMara (Jeffersonville-Youngsville), Jennifer Pellman (Liberty), Marissa Rivera (Liberty), Carly Sklar (Liberty), Kelly Theis (Jeffersonville-Youngsville), Amanda Weickum (Livingston Manor), Jessica Wright (Livingston Manor) and Jennifer Wright (Livingston Manor). Joe Meola is the team manager and the coaches are Gene Smith and John Wilhelm. The SC team will play games versus area teams Newburgh, New Windsor and Pine Bush over the next few weeks. In July, an all-star team made up of players from each of those four teams will represent New York State at a tournament in Maryland. Although many organizations in the Livingston Manor and Roscoe area have made donations to help the team with its expenses, Meola noted that any future donations would also be greatly appreciated. And even though this season has already started and the roster is set, Meola is looking for players for the 2001 Sullivan County team. Girls must be between the ages of 16 and 18 to play for the team. Specifically, a girl must be 16 years old before August 1 of that season or celebrate her 19th birthday after the August 1 deadline. The team returns to action tomorrow night with a 7 p.m. game at Newburgh. The next scheduled home game is a doubleheader at 4 p.m. on Sunday, July 9 at the Liberty Elementary School. For more information about the Sullivan County Big League Softball Team, contact Meola at (607) 498-4615.